Get your baby a pair of shoes for walking once she takes her first steps. Buying the initial pair of baby walking shoes is an important time in your child's life. You want to be sure to get the right fit and flexible sole while staying within a budget as well. Once your little one takes his first steps, you know it is time to start looking for a good pair of walking shoes. Keeping your child's feet protected and clean is a top priority for most parents. Doctors often recommend letting your child go barefoot at home or at grandma's to continue building his coordination. 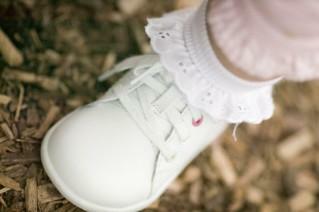 Flexible materials (such as canvas or soft leather) are better for baby's feet than hard stiff leather shoes. Shoe shop in the afternoon in case baby's feet swell during the day. You should also look for shoes with laces long enough to be double-knotted, but short enough so your child does not trip on them. Velcro fasteners may solve this problem for early walkers. As your baby becomes a toddler, he may learn how to take the shoes off himself. A high-top sneaker may be a good option if you want your child to have a little extra support. Although they may be harder to maneuver your child's feet into, they are also harder for kids to take off. As with any shoe, a proper fit is the most important purchasing factor. To get the best fit, you should go to a shoe store in person to find the size your child will wear. The clerk should measure your child's feet and suggest a few pairs. Do not be afraid to give a price range to the clerk that you are willing to spend. Did the shoe go on easily? Is the heel slipping off? Does my baby look uncomfortable? Is my baby crying or whining as he walks? Are there red marks on my baby's feet when the shoes come off? It is best to also bring (or have your baby wear) a sock with thickness you anticipate him wearing with the shoes. Because a baby's feet grow quickly, you may want to consider buying a pair in the next size up if the price is right. During growth spurts, a baby may outgrow the shoe in a matter of weeks, but stay in the next size for several months. Sandals can be harder for babies to walk in if they are not properly fitted. Make sure the sandal has a strap around the back to help it stay on. If your child is still unsure on his feet, you may want to hold off on purchasing summer footwear until he is steadier. As babies learn to walk, they may have a slightly odd gait or strange turning of the feet. While common as children learn the new skill, you should bring up any concerns you have with your doctor. Ask your doctor where to pick up specially fitted shoes for your child. A baby shoe store may have inserts you can pick up; or you may have to seek out a specialty store. Ask other moms you know for recommendations regarding the best shoe brands they have bought their kids. They will know what baby walking shoes hold up the best, or which area store has the most helpful clerks.